1Pre-heat a medium frying pan to medium high. 2 After veal is pounded thin, dredge each cutlet in flour salt and pepper. 3Whisk eggs, then add 2 tbsp water to the eggs. Dip floured veal into egg wash.
4Take the veal from the eggs and dredge in seasoned breadcrumbs. Add olive oil to the heated pan. 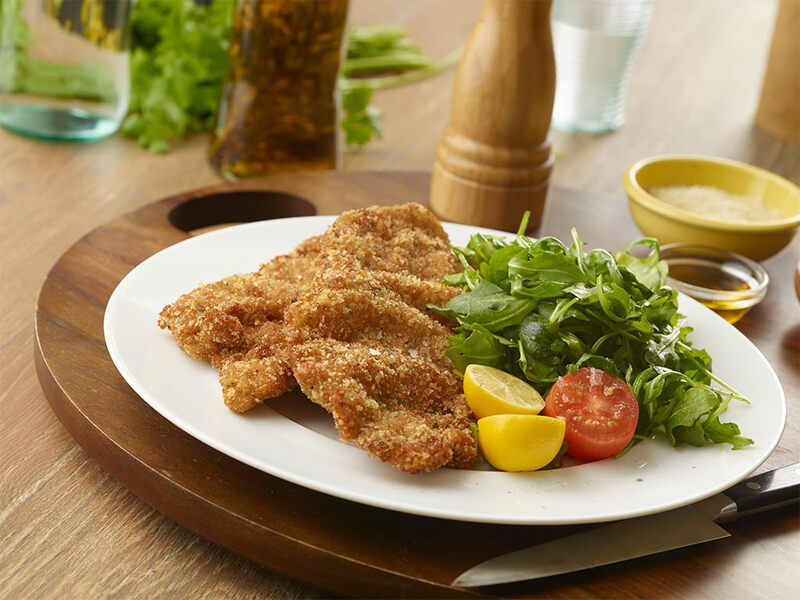 5When olive oil is hot, fry the veal for about 3 minutes on each side or until it is crisp golden brown. Remove veal from the pan and set aside. 6Place arugula in a large mixing bowl. Drizzle in olive oil, add in the cut tomatoes and squeeze lemon juice in. 7Toss together and season with sea salt. Place salad on two plates and add one veal cutlet to each salad.